Bigger is better –this is the motto that we’ve been accustomed to; however, smaller products and smaller form factors are becoming more and more prevalent in the computing world. Take a look at the new form factors of the upcoming Apple MAC Pro and Valve’s Steam Machine Prototypes; they’re created small to save space and to blend with your array of furniture, decorations, and office equipment. With Mini ITX PCs you can significantly reduce the size of your system and take advantage of all the extra space for something more useful. Many manufacturers such as Cooler Master create various Mini ITX chassis to accommodate different styles that are best suited for your needs. You would essentially have the same performance of a standard-sized computer by utilizing every inch of a mini ITX chassis. For example, many Mini ITX cases such as the CM Elite 130 can accommodate full sized Power Supply Units, along with a full sized Graphics card such as Nvidia’s GTX Titan. The latest ITX Motherboards (Depending on model) can support the most recent CPU’s of all socket types such as LGA 1150 Haswell processors as well as up to 16GB DDR3 Memory. Space Saving: This can be extremely beneficial in small settings such as a dorm room where a computer is necessary yet space is very limited. It’s also compact enough to fit in small offices or in your living room on top of your TV stand. Portability: Mini ITX systems are exceptionally portable which is useful to bring to LAN parties or carrying it on-the-go as portable network storage (server). The Mini ITX can also be used as a portable workstation if your laptop’s processing power just isn’t enough to run resource intensive programs such as CAD. Power vs. portability doesn’t need to be a tradeoff. Appealing: Let’s face it, mini ITX systems are attractive. Bringing them to a friend’s house or having them displayed in your media center will certainly turn heads. Choosing the right mini ITX that suits your needs can be a complex task. Larger Mini ITX cases may have with more available 3.5” & 5.25” drive or device bays, but if it’s too big you lose the space saving benefit of using a mini-ITX setup. An important factor in selecting a decent case requires a balance of overall size and available internal space, but should also cater to the intended user applications. We, at ICY DOCK, are always working diligently to produce storage solutions that are flexible, reliable and user friendly. Our guide aims to employ every inch of available space in a Mini ITX configuration to showcase the flexibility of our conversion kits. These cases may be featured in future articles so please stay tuned! Servers need to have speed and capacity with redundancy features for backup which means more drives will be required for the server setup. With the prices of SSDs and HDDs decreasing steadily, it’s a great time to install multiple drives in small business servers. 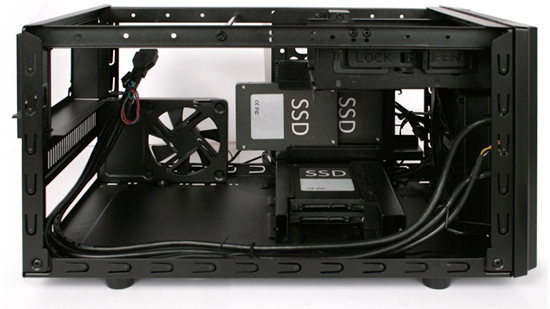 Using the ICYDOCK MB996SP-6SB it’s possible to install 6 SSDs/HDDs in the front 5.25” bay of a mini ITX case, and if desired, it’s possible to configure these into a RAID 5 or 6 configurations for ample storage space and faster read/write speeds. The single 5.25” bay provided by the Cooler Master Elite 130 is now capable of housing 6 x 2.5” hot swappable drives which is a necessary feature in most server builds. MB996SP-6SB – Recommended for RAID 5 or RAID 6 setup (Depending on your motherboard, it might not have enough SATA ports so check if a PCI-E controller card can be added). This can be use for full SSD server, or HDD server build depending on your need and budget. With the Cooler Master Elite 130 case, after installing the MB996SP-6SB, there’s still space for 2 x 3.5” drives or 3 x 2.5” drives. Combine use theMB996SP-6SB + 2 x EZ-Fit brackets will give you total 11 x 2.5” slots which equal to 11TB with SSD build, or 16.5TB with HDD build. It’s an amazing amount of storage for such small case. MB994SP-4S – If SAS HDD/SSD builds are what you’re seeking or if you want to build a server with the 2.5” 2TB WD Green drives, then you need an enclosure that’s compatible with SAS HDD/SSD and accepts 15mm drive height which is exactly what the MB994SP-4S provides. *For SAS HDD/SSD you’ll need SAS capable motherboard or controller card. If you plan to run RAID, verify that the motherboard or controller card supports it. MB994IPO-3SB – If a huge capacity is not your main concern and a optical disc drive is required, theMB994IPO-3SB is perfect for you. You can run RAID 1 or RAID 0 with this build with 2 x hot-swap bay and still have access to the slim CD/DVD/Blu-ray if necessary. HTPCs (Home Theater PC) can be an awesome addition to any home theater setups and they’re easily customizable since you’re able to handpick the parts and build it yourself. If you’re looking to build an HTPC with a Mini ITX case, then you’re probably looking for a versatile device that can accommodate both 2.5” and 3.5” HDD/SSD with hot-swap functionality, or 2.5” HDD/SSD and a Blu-ray disc drive. The configurations below demonstrate the flexibility and options you have for creating an HTPC. MB971SP-B – It allows you to hot-swap both 2.5” and 3.5” drives as quickly as possible. The MB971SP-B is just like the HDD docking station but internally, which means it takes less space and power, provides direct SATA 6Gbps transfer speed, and the best part is it fits both 2.5” and 3.5” simultaneously. If additional drives are needed in the future, you still have up to 2 x 3.5” or 3 x 2.5” space in the case, or up to 5 x 2.5” slots if use with the EZ-Fit brackets. MB994IPO-3SB – This is an excellent setup for HTPC in Mini ITX form factors. It allows for a slim Blu-Ray disc drive in addition to 2 x hot swappable storage drive for your HD movies. Here’s an example: mount 2 x 4TB 3.5” hard drives on the side and bottom of the Elite 130 case for your movie collections (total 8TB). And add a slim Blu-ray disc drive with the MB994IPO-3SB so you can enjoy your Blu-ray movie collections. With the hot-swap 2.5” bays, you can add 2 x 2TB WD green drives to the bay. There are two options to optimize the 2.5” bays. You can run RAID 1 with it (through the motherboard) and store your OS and important data such as family photos and videos in the RAID 1 volume in order to prevent the drive failure. You can also use the two bays as expansions for your movie and storage collection and easily swap drives when needed. MB343SP + MB992SK-B or other 3.5” device – 3.5” multi-media reader or 3.5” audio device could be very useful for a media system, if there’s only a single 5.25” bay available on your chassis (which is the case for the Cooler Master Elite 130), you’ll need a 3.5” to 5.25” adapter to convert the 5.25” slot into a 3.5” slot for 3.5" device usage. There are a lot of adapter on the market, but none of them like the MB343SP. The MB343SPoffers unique tool-less design which allows you to quickly install the 3.5” device without any tools. It also gives you additional 2 x 2.5” HDD/SSD slots with tool-less design to utilize all the space. Every gamers’ dream is to own a high performance ultra compact PC. If you’re an avid gamer you know how frustrating load times can be. While your friends are off in the battlefield fragging other players, you’re left still in the loading screen until the match is almost over. SSDs have become a main component in gaming rigs because of their ability to quickly access data such as texture, models, and other files thus loading faster. Sometimes a single SSD is simply not enough to store all your game files so you may accumulate multiple SSDs over the course of time. Since Mini-ITX cases have limited internal space to work with it may be difficult to add/remove HDDs or SSDs from the case once you’ve completed the setup. Being able to optimize the internal space and maintaining flexibility is an important attribute of a compact gaming system. MB343SP (3.5” HDD or 3.5” device + 2 x SSD/HDD in RAID 0 or RAID 1) – Gamers often overclock their components (e.g. CPU, GPU, Memory) to squeeze the most performance out of their system which in turn results in higher FPS. The downside is that heat increases when increasing clock speeds. Additionally, heat may build up from a lack of airflow when fan speeds aren’t sufficient enough. Adding a 3.5” fan speed controller allows you to improve your system both performance-wise and aesthetically. Using the MB343SP, it’s possible to optimize a single 5.25” bay to fit 2 x 2.5” SSD/HDD and an additional 3.5” device. Running out of storage? Install a standard sized 3.5” Hard drive in the 3.5” slot of the MB343SP for additional capacity. For maximum performance, configure 2 SSDs in RAID 0 via motherboard RAID controller for snappy load time in games and other applications or configure RAID 1 as a precaution in case of drive failure. There are many possible configurations with our products. If you require Blu-ray or DVD support it’s possible to add a slim ODD to the MB994IPO-3SB in addition to 2 hot swappable 2.5” drives. If you need to quickly swap out both 3.5” and 2.5” drives, the MB971SP-B allows you to perform that task. For multifunction builds such as server + gaming PCs, the MB994SP-4S or MB996SP-6SB would be a desirable component to have. No matter what type of the system you’re trying to build, you’ll always find the products you’re looking for from ICYDOCK.